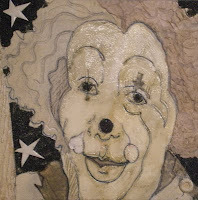 Susanne Clark's blog about: - Creating paintings in oil and acrylic - Collagraph Intaglio printmaking - Daily life in the Studio - Ideas and thoughts on artmaking. I have been looking forward to seeing this show for some time so the morning after it opened I was up early and eager to get there before the crowds. On to the subway and a quick walk along Front St and I was at the Metro Toronto Convention Centre but I was too early. It was only 10:30 and the show was not due to open until 11:00. I couldn't find anything showing where to buy the tickets so after a few minutes I asked one of the artists who was standing nearby with a couple of paintings only to realise that I was so eager to see the show that I was there a day early! I had somehow lost a day and thought it was Friday when it was only Thursday. I took my sorry self home again. The next day I did a re run. The show is quite big, around 210 booths, with independent artists and galleries showing. The galleries are located in the centre of the layout and they are nicely set up with lovely white walls and professional lighting and signage. Around them are placed the solo artists and their booths are less classy. They are supplied with grid walls with a white curtain backing which looked ok. Very few had upgraded their booth walls with their own panels like propanels for instance. The show draws galleries from other cities and I spoke briefly with a gallery rep from Los Angeles. I asked him if it was worthwhile to come all that way and he said he would have to wait and see as he hadn't done this show before. I mentioned I had heard that the Art Expo in NY city had been experiencing a drop off in attendance but he said he thought it was still good even if a bit smaller. I was glad to see one of my favourite galleries from Ottawa, Galerie d'art jean Claude Bergeron there. I like them because they show some really good printmaking, a form of art that he thinks is good in this more challenging economic climate as it is generally less expensive. The show was, in my mind, quite uneven in quality. There were some large booths showing what I think of as mass produced designer wall pieces. These are large decorative pieces with panels of texture and gold and nothing really in them. Some of the large gallery booths had interesting work but nothing that took my breath away or that I would really have loved to own. The work of the independent artists ranged from very good to quite amateurish and a couple were awful both in content and the way it was displayed. One interesting artist produced scanner photography. He puts objects on a scanner bed and then overlays and manipulates the imagery in his computer until he comes up with a composition he likes. 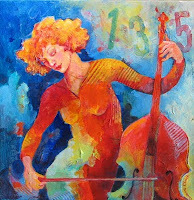 A young trendy looking artist originally from Russia had paintings that glowed with the most amazing blue. I liked those. Quite a lot of sculpture was shown but nothing that had real soul or spoke to me which was a pity as I love interesting sculpture. I have a couple of artist friends on facebook whose sculptural work would have stood out in this setting. I had a nice time. I met up with a woman who was showing near to me at the Distillery Art Show in the Summer and then chatted with another really nice artist who was very friendly and invited me to go as a guest to her art group who meet once a week for critiques. Both these woman had done the show several times before and although it is expensive to take part in, they both felt it was worthwhile. As for attendance, well there was a snow storm the day I went and Saturday was pretty bad too. I will get an update from one of the artists after it finishes so that will be interesting however I don't understand why they don't hold it in late March or April when the weather is better. 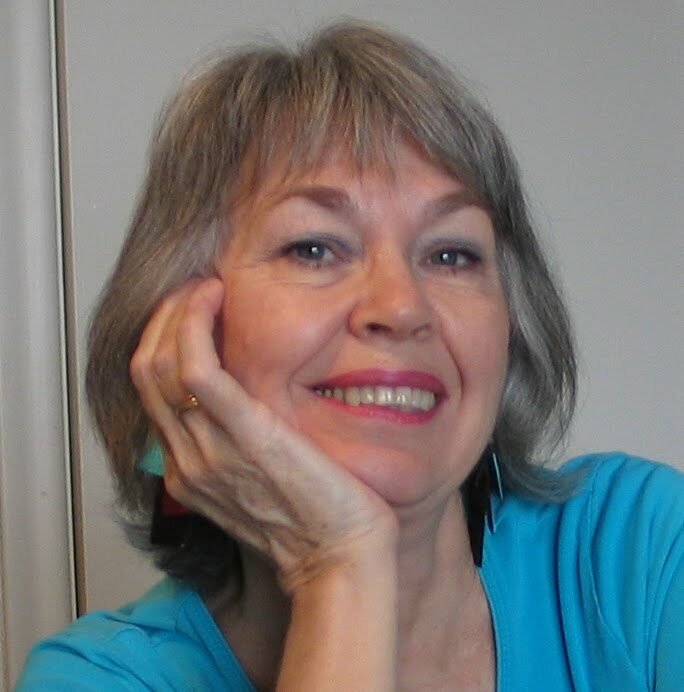 Just a note to end on, when writing these posts I am always aware of the difference in the way words are spelt in the US and Canada and I am never sure which to use. Mostly I tend towards the Canadian way, which is the same as the spelling I learnt growing up in NZ. This has been a good week. I am finally getting back into the studio and getting work done. I'm also having fun. I eased into it by making some simple prints, 4 x 4in, that will be great as handprinted cards. 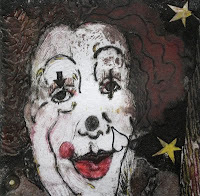 These are like the first clown print I made. One of the designs I liked the flow of so I enlarged it to 12 inches and made it into a painting. It's a lighthearted colourful work. I am now in the process of doing a companion piece from one of the other designs and that's coming along nicely. I have also nearly finished the combined painted / printed work mentioned in previous posts and will post a photo once it is finished. In many ways I prefer the piece I did on paper to this one on board however I have learned a lot from the process and can see possibilities for future works. I am also eager to do some more serious printmaking so lots to think about. Today however I am hanging some of my musical works in The Toronto Institute for the Enjoyment of Music, a new music school in down town Toronto on trendy Queen West. It's a lovely space and I will be showing my work there on an ongoing basis. 1 The plate finished but not yet coated with sealant. 2 The plate after sealing with shellac. 3 The printed collagraph. You will notice that they print in reverse. 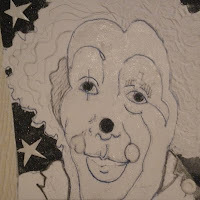 I am a painter and intaglio collagraph printmaker living in Toronto, Canada. New For 2015: My Art on Your Sofa!